Go into the remote backcountry. Travel as a crew, living only on what you carry with you. Build memories you’ll never forget. Get Out And Lead (GOAL) is an Outward Bound scholarship program that has been developed to cultivate budding leaders through the unique challenge of a 10-day wilderness expedition. 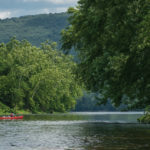 The journey, specifically for designed for rising 8th graders (summer between 7th & 8th grade) includes backpacking and canoeing the wilderness of the Mid-Atlantic and rock climbing picturesque cliffs. You and your peer leaders will eat, sleep, and work together to ensure an unforgettable experience. Selected applicants will have the opportunity to learn the value of cooperation and communication in a challenging, team-oriented environment. Upon completion of the course, you will return home with new skills, exciting stories, meaningful friendships, and insight into the strengths that lie within you. As a graduate of Outward Bound’s GOAL program, you will have opportunities to cultivate you leadership skills to benefit your community through service projects, reunions, and workshops throughout the year. The GOAL Expedition is a merit-based scholarship expedition awarded to some of the area's elite youth leaders who are excited to challenge themselves and discover their leadership potential. This scholarship is available for rising 8th graders interested in attending this summer’s expedition in the Delaware Water Gap. Looking for our Youth Leadership Corps (YLC) course for rising sophomores and juniors? Head here. Apply online: Complete application, including a personal intent essay and two letters of recommendation. Submission Deadline: THURSDAY, FEBRUARY 28, 2019.